The estranged wife of Bandit Lites CEO Michael Strickland is suing him, his girlfriend Allison Burchett, his company and a cellular sales retailer for conspiracy, identity theft, invasion of privacy and libel. Jo Nicole Velasco Strickland is asking for a combined $1 million in Knox County Circuit Court. The action was filed Wednesday afternoon. 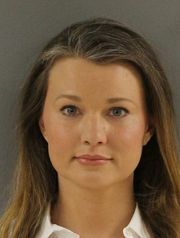 The lawsuit, in part, ties into the recent arrest of Burchett, the former wife of Knox County Mayor Tim Burchett, who was charged earlier this month in Knox County Criminal Court with 13 counts of identity theft, computer crimes and tampering with evidence. Named as defendants in the lawsuit besides Strickland and Burchett are Bandit Lites Inc. and several variations of Cellular Sales. Bandit Lites is a defendant, the lawsuit states, because Michael Strickland and Burchett acted under the apparent authority of Bandit Lites in some of their alleged acts of wrongdoing. According to the lawsuit, Nicole Strickland was a Cellular Sales customer and the firm was negligent in allowing a third party to access her "personal and private information."